Make your mornings less stressful with this healthy breakfast recipe for Crock-Pot Spiced Peaches & Cream Steel Cut Oatmeal. You can prepare the oatmeal the night before and wake up to the luscious scent of peaches and warm cinnamon & spice. My family has been incorporating oatmeal in our diet more often, so I have been making steel cut oatmeal overnight so in the morning we have warm freshly cooked oatmeal ready to go. This recipe for Crock-Pot Spiced Peaches & Cream Oatmeal is super tasty and easy to make too! The perfect breakfast. I just use canned peaches, oatmeal, spices, brown sugar and milk. I love how easy this recipe is to put together. And I REALLY love how delicious the house smells when I wake up. The whole kitchen smells of cinnamon of peaches in the morning! My kids love this oatmeal too. And to be honest, they seem to do better in school with a good protein in their bellies. A bowl of cold cereal just doesn’t cut it. And since the oatmeal is ready to be served as soon as they wake up, it is easy for them to help themselves to some breakfast. They are always in a rush to get out of the door to school. Mornings can be so hectic sometimes, I love knowing that this helps with that. 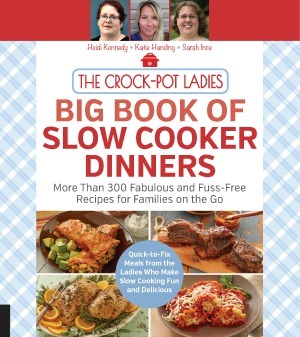 I used a 4 quart programmable slow cooker for this recipe. You will definitely want to spray your crock with cooking spray so the oatmeal doesn’t stick. And this only needs to cook for 5 to 6 hours, but can cook longer if necessary. If your slow cooker automatically switches to the WARM setting after it is done cooking for the time you programmed it that is even better as it will keep your oatmeal warm until morning. Leftover oatmeal can easily be reheated either in the microwave or on the stove-top. You could even top re-warmed oatmeal with ice cream and have it for dessert! Wake up to the smell of warm cinnamon & peaches with this healthy steel cut oatmeal recipe! 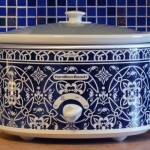 Add the steel cut oats to the slow cooker insert that has been sprayed with non-stick cooking spray. If you would like smaller pieces of peaches, strain the juice into the slow cooker and cut the peaches into bite sizes. Otherwise, just dump the peaches with their juice straight into the slow cooker. Add the brown sugar, cinnamon and salt and lightly stir it into the mixture. Cover and cook on LOW for 5 to 6 hours or overnight. I prefer to cook my oatmeal in milk because that is just how I grew up eating it. It adds extra protein, calcium, etc. However feel free to use water if you are watching your calories. Non-dairy milks should work well in this recipe although I have not personally tested them. So feel free to experiment using almond milk, soy milk etc.